The tragic events that occurred on September 11, 2001 in New York are burned into the country’s collective memory forever. 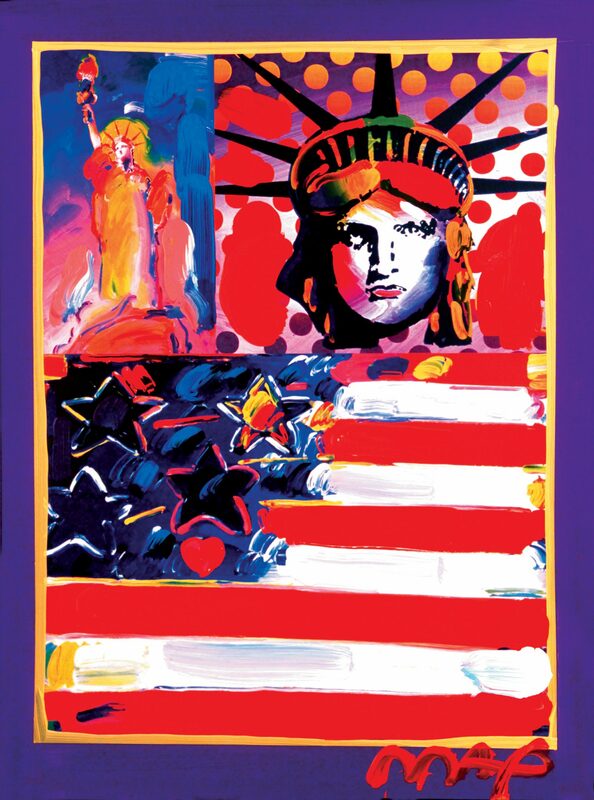 As we reflect on those trying times, we also remember the relief efforts of artists such as Peter Max to help those who suffered. Though Max wasn’t born in America, he fell in love with the country and what it stands for at the age of 15. He considers himself a “tried-and-true New Yorker,” so he, like so many others, was devastated following the attacks on September 11. 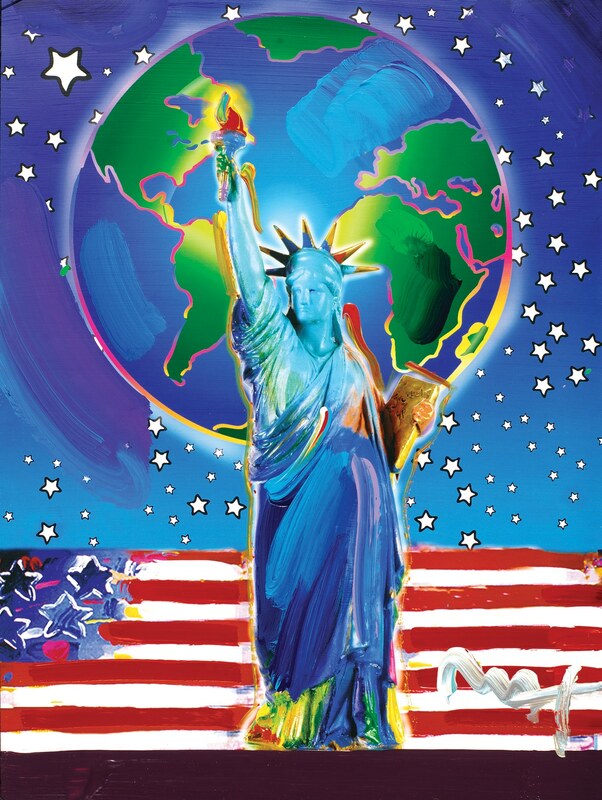 A work featuring the Statue of Liberty and American flag in the foreground and the Earth amidst a starry background. The imagery calls upon patriotism, but also Max’s desire to see world peace achieved. 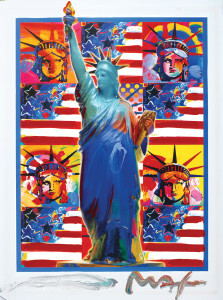 “God Bless America – With Five Liberties” (2001), Peter Max. 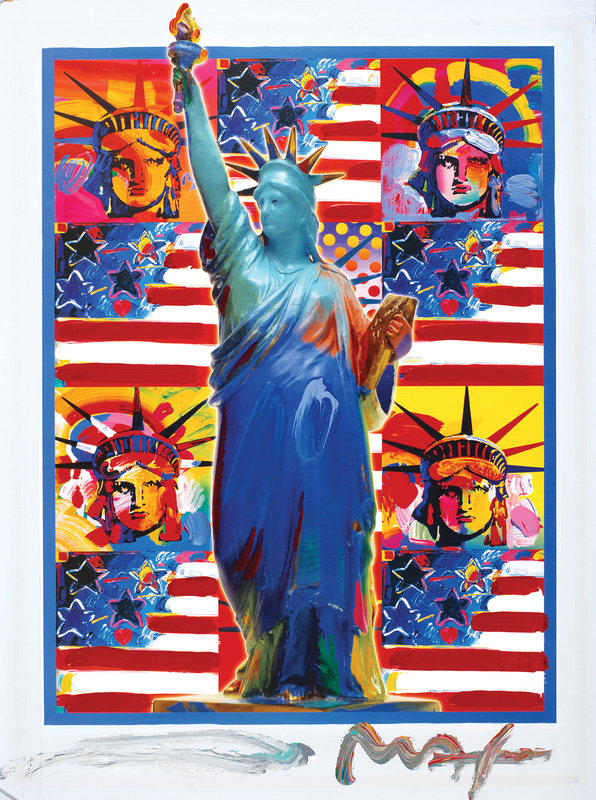 Max takes his love of liberty and multiplies it by five in this colorful work. The repeating pattern of the statue’s portrait alongside the U.S. flag evokes a sense of patriotism, reminding us of the freedom and creativity we celebrate in America. It is worth noting that Max painted the famous statue’s portrait on Independence Day in 1976 and did so for many years after that, gaining the attention of the White House, where he painted his sixth portrait in the presence of Ronald Reagan. Lady Liberty’s portrait makes an appearance alongside a full figure painting and Max’s rendition of the U.S. flag. 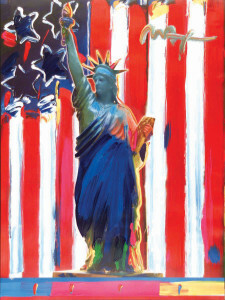 Max again draws upon American icons like the Statue of Liberty to reflect his love of America. Max worked with Lee Iacocca of Chrysler in the ‘80s to raise funds to restore the Statue of Liberty. 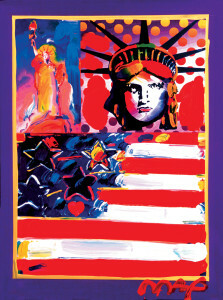 Lady Liberty receives a Warhol-like treatment with Max’s colors and style. 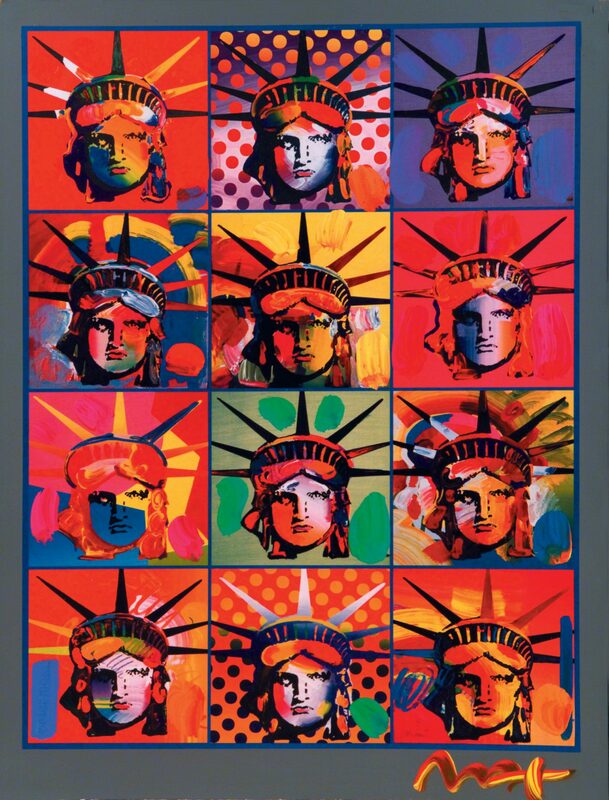 One interpretation to consider is that depicting the Statue of Liberty in so many different colors visually shows that all deserve liberty and justice, regardless of race or background. This work varies from its counterparts. Though it still features the iconic Lady Liberty, she looks more like a miniature placed in what could be a memorial for 9/11 victims. The artwork reminds us to never forget those who we lost on that tragic day. 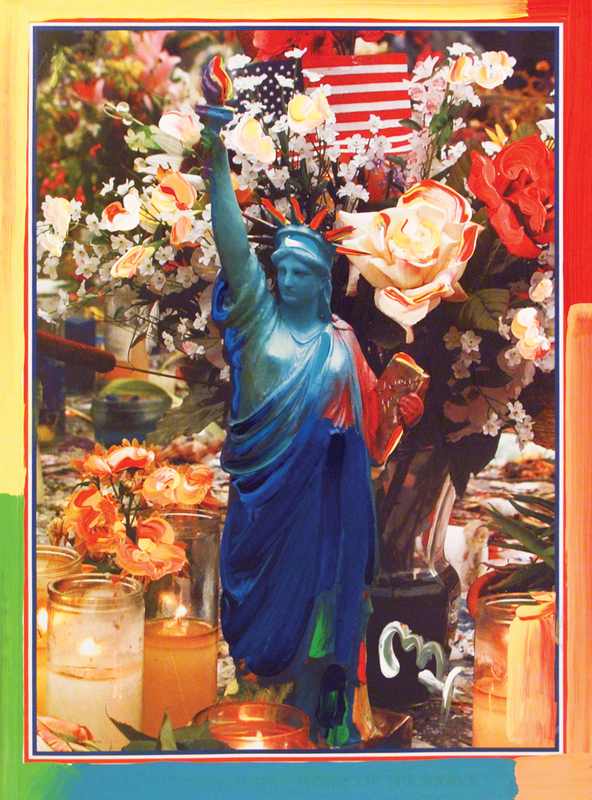 A bold, impactful expression of patriotism with the Statue of Liberty set in front of Max’s colorful U.S. flag. Combined with its title, Max captures the feeling of camaraderie and unification the country and its citizens felt following the tragic events at the World Trade Center and Pentagon. Max also created portraits of the 356 firefighters who lost their lives at the Twin Towers and the Pentagon. He acquired photographs of the firefighters used on photo IDs to paint each portrait. Every evening when I go to bed I gaze at my Peter Max painting. Every morning I wake up and see the same painting. 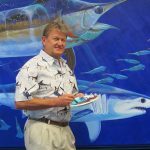 I purchased this painting on a cruise to Bermuda in the spring of 2013. I was taken by the simplicity and passion that the painting depicted. When I saw it, it was from a distance, not knowing who had painted it. When I inquired about it, I was so impressed that I wanted it. Well I bought it through Park West, who’s staff were pleasantly accommodating so much so that my wife and I met with Peter Max and gained some more info in the hour we were together. The painting was of the Statue of Liberty with the American Flag, a Heart, Planet with a gold ring around and stars, and a Peace Bird. My interpretation, Freedom, Love, World Peace. Peter Max, We bought three more. I bought 3 Peter Max paintings while cruising Europe aboard the Emerald Princess this summer. 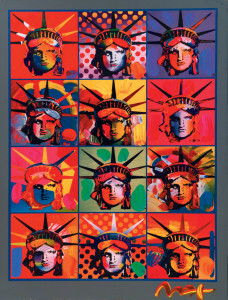 I fell in love with Peter Max on a Carnival Cruise years ago. I had always wanted one and this year my dream came true (X3). I hope I will be able to meet Peter Max. I first saw a Peter Max painting years ago on a Royal Caribbean cruise and after visiting New York in 2013, I knew that I had to have one. I was very lucky to buy one this year on Sea Princess through Park West. I am now waiting delivery. 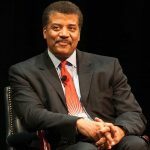 Would love to meet him some day. You are a genius!! You are right, we should be patriotic and stay beautiful and free.